There’s little value in onboarding new business if your customer attrition rate means that the overall ongoing customer number/recurring revenue remains more or less the same. That is why it is so important to track customer churn. ‘Churn’ is the rate at which businesses lose customer recurring revenue over a given time period. In MSP-land, this period is normally a month, given the typical MRR cycle. Churn includes customers who jump ship to a competitor as well as those who, for one reason or another, reduce the amount of services they take from you. Yes – to an extent. Customers may no longer require your services because their own business situation has changed. They may have merged or been acquired, with implications for the way their IT is managed. They may have decided to take IT back in-house. They may be downsizing, so fewer of your services are required. Or, having signed up, they may quickly realise that partnering is not for them: evidence points to a higher churn rate among new customers than those who have been with you for a while. But a high rate of churn is not inevitable – and it can hurt your business. The findings of a recent IT Glue survey showed a definite link between churn and financial performance. 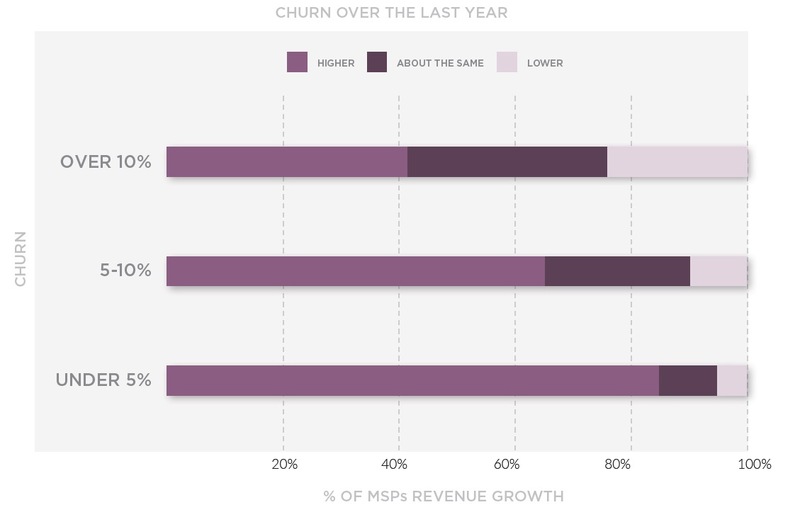 Results showed that over 80% of MSPs reporting churn under 5% in the previous year also experienced higher revenues, compared with only 40% of MSPs reporting churn over 10%. There are obvious reasons why high churn rates are linked to poor financial performance. You need to measure the new business coming in at the top of the sales funnel against what is going out at the bottom. The average North American MSP adds 9.6 new customers per month – but this will only contribute to growth if existing accounts are retained. MSPs apparently lose on average 2.23 accounts per month. The actual figures vary, but I think we would all agree that it costs considerably more to acquire new accounts than to keep existing customers happy and receptive to upselling/cross-selling. High churn rates reduce customer ‘lifetime value’ and drive higher cost of sales to replace lost customers. The result is less profit for your bottom line. Tracking customer churn gives a snapshot of the health of your business – and of what customers think of it. A sudden or sustained increase in the churn rate is an indicator that something is wrong and questions need to be asked: Why is it happening now? What have we changed? Is it restricted to a particular sector or size of customer? It is also important because churn rate is a metric used by investors to assess company health. High churn can lead to questions about company viability. In a blog earlier this year, SolarWinds MSP introduced a simple methodology that they use to measure the real impact of churn on the business. Quick Ratio measures growth divided by churn, to produce an easy to understand ratio. The article pointed out that a Quick Ratio of 0.55 every month would lead to a contraction in your MSP business over time. Scoring a monthly Quick Ratio of one, would see your business staying the same size, while a Quick Ratio of two would indicate a healthy rate of business growth. This is just a snapshot of your business, fed by a couple of key metrics – but it is useful to identify trends and to set high-level performance targets. And it can indicate when you need to dig deeper to find out why churn rates are changing so you can address the underlying causes. The downside is that it is a backward-looking indicator: by the time you have the Quick Ratio number you have already lost the customers/revenues. So, preventative measures and warning systems need to be in place. The flip side of ‘churn’ is customer retention. A significant amount of churn could be prevented if an effective customer relationship management (CRM) strategy is in place. My next blog picks up this theme and suggests 10 ways to improve customer retention and reduce churn. Contact us or chat now to find out how we can help you ensure high levels of service for your customers by partnering for NOC and Service Desk.